Writing this blog series was WAY harder than I expected! I set out to tell Hello Kelly’s story in full & blunt honesty, but I honestly learned so much about myself in the process. I’m serious! In Hello Kelly’s 9+ years, there was constant pressure – either form inside or outside the band – to be, act, write or play a certain way. If you can relate to that feeling of people having expectations of you, you’re going to like this post. I had a lot on my plate towards the end of 2011, both literally and figuratively. I was writing & planning two records simultaneously, crafting my second feature-length screenplay, pursuing lifelong dreams in Nashville … But I was all alone. At a Shoney’s. On Thanksgiving. I’d been doing my best to field the latest disheartening band drama but, at the beginning of 2012, bassist George Wong moved on. This was tough because his pragmatism really brought balance to the band and he’d become a really great friend. We’d spend the rest of 2012 employing four fill-in bassists – Kevin deSouza, Colin Carter, Reece Bors and Lee Hardin. From years of operating without vision, Hello Kelly felt like a cluttered home you’d see on the TV show Hoarders. I decided that the only way to know what (if any) potential still remained in the foundation was to gut the house and, if necessary, burn it down in the process. So began a year where suddenly no conversation or decision was too hard. We’d hired an attorney who was confident he could find a loophole in my long-frustrating contract with 7Spin Music. At the same time, we were still slyly planning to hand off a phoned-in, cheaply recorded set of songs to the label. This was our back-up plan; we were determined to be free of them one way or another. Production kicked into gear in 2012. We were working with a production team comprised of Brandon Perdue and Kevin Bruchert. After some tense pre-production sessions and having to re-cut some early bed tracks, it was difficult to recapture any sense of excitement. A certain “this was supposed to be fun, but now it’s a chore” vibe hung in the air – it didn’t help that everybody was dealing with personal matters at the time. For me, it was that I’d become incredibly lonely. This was my third year in Nashville and my dilemma was simple: Is Nashville home or is Ontario home? “I don’t want to open myself up to dating here in TN if I’m not gonna be here for the long haul,” I told myself. “That’s gonna hurt.” I’d been hanging out with a really special girl named Julia, but I’d been keeping her at a distance since I was in this limbo. Back in the studio, we found ourselves having to trim some fat to stay within our tight budget. First, we jettisoned plans for our zombie-apocalypse themed narrative interludes. Next to go was a handful of songs that contributed big-time to the record’s grander zombie motif: Going Viral, Digging Deeper and Sunshine. Sadly, we never revisited these things and the zombie concept was never spoken of again. I often wonder how the concept record could’ve turned out, but so it goes. My priorities began to shift in big ways when Julia and I started dating. I’d come to believe that time was my most valuable commodity … and here she was asking for some of it? I resisted big time! Slowly but surely though, I felt blinders lift and began see that there was more to life than my pursuits. It was a gift. A good friend of the band, Kevin Pauls, had contacted the Stuttering Foundation on our behalf, suggesting a partnership. We found ourselves in New York City at a Stuttering Foundation gala where they presented me with the “Converting Awareness into Action” award, “for the hope and inspiration he brings to the stuttering community.” This was a massive honour because it spoke not to my talents or achievements, but to the fact that I’d never let my stutter shut me up, which is a big deal. The award did something else though. All my life, I had known that fluency (for me, defined as the ability to speak clearly in spite of my stutter) was possible, but it would take me working harder than I ever had. Honing and using speech shaping skills requires huge amounts of discipline. Receiving that award for supposedly inspiring the stuttering community but knowing I had zero control over my own speech … I felt a responsibility to rectify this divide … But I’ll get to that later. Our attorney notified us that his plan was dead in the water. My band mates and manager came to me with a stipulation: They wanted everyone to sign member & manager agreements, and they wanted to change the band name. “This will give us a better chance of making a fresh impact with no baggage,” they said. “We’re just not Hello Kelly anymore.” I couldn’t help but think of the fans, especially those who we’d picked up recently thanks to Hello Kelly’s newly revived sense of vision. It felt selfish to scrap all that. But I couldn’t argue that a fresh start sounded appealing. “I’ll never have to hear another ‘Hello Kitty’ joke,” I thought. I peeled the vinyl HK & giant bird decals off of my van, and I have to confess that I felt a sense of freedom. The other foot dropped when our manager inexplicably scared away the investor. The money was gone. This was a big defeat & dream killer. The “name change” conversations had gone too far and there was no reversing the tides with my band mates. Completely broke, we cut our manager loose and made a video announcing the end of Hello Kelly. We promised a new start, a new band and the new record. We had been counting on investor money to fulfill our Kickstarter promises. Most bands have Kickstarter figured out by now, but we didn’t back then and we made a big mistake: By offering perks that were expensive to manufacture & ship and not setting any money aside, we set ourselves for what I consider to be Hello Kelly’s singular big failure. We were never able to fulfill those orders and we let a lot of people down. I don’t have many regrets, but that’s another one of them. 2012 ended in a fog of futility. 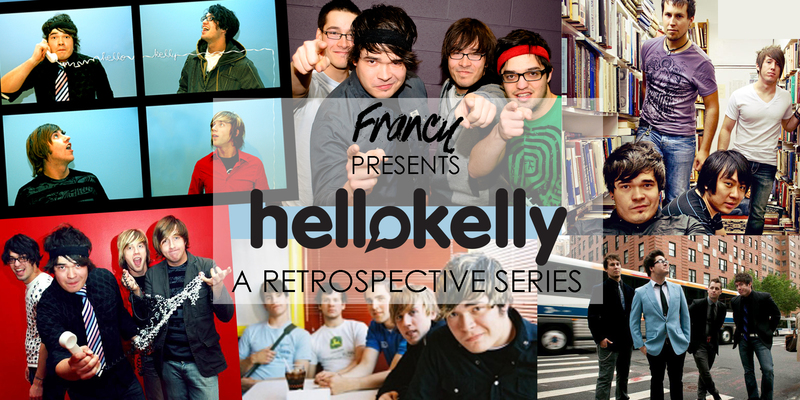 We played Hello Kelly’s final show at Rocketown in Nashville – an anti-climactic event featuring a sloppy, unrehearsed incarnation of the band. I sat in the van alone for a long time after the show. It was the last time I’d ever do it. I proposed to Julia that Christmas. Weeks later, I found myself in Edmonton at ISTAR, an 3-week intensive speech therapy program in Edmonton. I’d had various forms of speech therapy all through my life but practicing speech shaping skills for 3 weeks straight is what finally convinced me that fluency was actually possible. This is something I work on daily, and some weeks are still harder than others. But ISTAR is no joke. That place changed my life for real. Back in Nashville, I told Wilbourn and Mahaffey that I had to bow out of our plans for a new project. This was me hanging up the guitar; not only was Hello Kelly done, but I was done too. They understood and gave me their blessing to release our final record as the beginning of my solo career. I released it first as Francy & The First-Time Feeling and again later as simply Francy. 7Spin distributed the record to iTunes and Spotify unceremoniously – no publicity, fanfare or press release. We never even got to tour that record. It was bittersweet – my obligation to the label was finally fulfilled after 6 arduous years, but it had meant 2 authentic & exciting records being all but shelved. To raise money for my wedding, I returned to my hometown in Ontario for a few months to work for my dad’s construction company. If you ever want to feel a sense of defeat, try ditching your dream and doing siding in the freezing rain instead. If those months were a desert, my wedding was a water park. I’m so grateful for that day. My amazing family, my incredible wife, Julia. If you’re married though, you know the trials that come with Year One. You have to learn how to be married. It’s a real thing. For me it started on Day 3 of our honeymoon: I woke up and realized that I’d decided to no longer be single, to no longer hide behind my stutter, and to no longer be in a band – all in the span of a few months! Those three things defined me before – and now they were gone? I felt like an avocado that God had spooned all the green stuff out of. I spent a year panicking. “What do I do now?” “Do I have anything to say anymore?” I played in skeezy cover bands to pay the bills, and spent the rest of my time chasing my tail, trying to push away that “aimless” feeling. (Pro tip: This is also known as “medicating.”) I had lots of random ideas – EPs, screenplays, ministries, YouTube channels – but there was no connective tissue. Imagine a genius chef excitedly emptying his cupboards, cooking & baking everything with care, thoughtfully mashing it all together in a blender and then using the concoction to shampoo his hair. That was me. I was so happily married but had no idea who I was. I was looking everywhere but had no vision. I think I was hoping my heart would suddenly be filled with new dreams, but the dreams that started filling my head were all my old ones! This I didn’t expect. The dreams I’d given up on years before, suddenly they felt possible again, like they’d been scrubbed & polished and handed back to me. The dreams I’d had taken away – they returned, repaired & reinforced. And the dreams I’d surrendered to the Lord in obedience – I got those back too. They were updated – tweaked by a Divine Co-Writer. I know I’m using really spiritual language, but that’s OK. It was a spiritual experience. I mean it: If you pray for dreams and have the balls to wait a while, things can start getting pretty exciting. The disconnected nonsense in my brain started to thread together. This idea merged with that idea in an unexpected way, and that project suddenly made more sense in light of this project. I could never have done all this on my own and it didn’t all happen at once. More like months. But slowly, priorities came into focus and I was able to write, plan and dream with intention! Clarity! Truly, it was a feeling I hadn’t felt since I first started Hello Kelly back in 2004. A friend from church was putting together a small tour and she needed an opening act. I’d been jamming with some buddies – Chris Vicari, Colin Carter and Christopher Murphy – but the band wasn’t ready for a tour. Due to my stutter, performing alone had never been a thought for me. Why else would I have suffered through 30 different musicians coming in and out of Hello Kelly over the years? But crazily, I heard myself tell this girl: “I can play the tour alone with an acoustic?” What!? But check it out: I was able to slow down and realize that I was a new Francy now. My head was clear with fresh vision. I don’t want to ruin any surprises from blogs I might write in the future, but suffice it to say that I crafted a brand new show called The Robot Speaks for that tour and, in a way, Francy was born in performing it. There were songwriting angles I hadn’t approached before. There were show ideas that I couldn’t have gotten away with in a band. Seeing the audience react to my bold & quirky one-man show was really cool because I felt like they were a part of the process. With each new crowd of people I found more and more of my voice, discovering how much more I had to say. I know how cheesy this sounds, but it was what I’d always wanted Hello Kelly to be! I was so humbled to see it come full circle that I decided to make a record! I’m not going to end this special blog series with a commercial, but if you’re reading this and you followed Hello Kelly then you really need to check this record out. I promise that it’s so perfectly & weirdly Francy. I wish I could tell you “And then I learned this huge amazing thing and achieved success!” That would be a pretty epic ending after all. But that’s just not how life goes. At least not for most folks. For most of us, life happens and then you get to look back and see what you learned, and then more life happens and you do it again. So here’s the deal. If you keep on using your wacky human voice, I’ll keep on using mine: Telling weird stories and singing about robots or whatever other crazy things come into my over-sized head. Whether there’s a bunch of you in the audience or just a couple, I can’t wait to hang out! Thanks so much for reading this long-winded thing. It was fun. Maybe I’ll write that book after all! PPS. Sign up below to get future blog updates, information about touring & new music, and a free download of my Best Of Francy & Hello Kelly collection.